It is no secret that political polarization has increased in the United States in recent years. 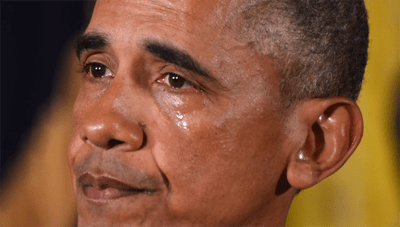 For those who heard President Obama speak on the need for sensible gun laws on Tuesday, January 5, 2016, it is clear that he continues to look for ways to find common ground with Republicans. Yet experience has taught him that this is unlikely now, because his presidency and the 114th Republican-controlled Congress are inexorably linked at the hip until January 2017. The differences between Republican and Democratic presidential candidates in 2016 could not be more palpable. Republicans viciously attack one another and speak in angry tones about the solutions to America’s problems. The three Democratic candidates reason together, and each seems to strengthen his or her positions by listening to the ideas suggested by the other two. There are those who say that under present conditions, the United States may be stuck in a long-term political stand-off with continued Democratic presidents and Republican-controlled houses of Congress. Is there any way that the messages from either party can resonate with voters who are undecided or identify themselves with the other party? Republicans like to cater to fear, and unfortunately, we do not know to what limit that might play. Life in the 21st Century is indeed frightening in many ways, and we all have cause to be concerned. For those who either do not have the inclination or the opportunity to step back, take a deep breath, and consider the best policies for tomorrow, the Republican Party may provide the kind of “quick fix” answers that they want. Democrats frequently try to broaden their appeal by calling on reason to connect with others. As I have previously written, efforts to communicate by reasoning are becoming more and more limited as America’s schools place far more value on standardized test scores than on students’ abilities to engage in critical thinking. When Democrats say that easy access to guns results in more gun violence, far too few people are able to take the next step; the step to support legislation to strengthen gun control. There are times when progressives have opportunities to try to strengthen the reasoning abilities of those who are challenged in this regard. But all too often, those opportunities are squandered. Renee Shur wrote here in 2013 how MSNBC has alienated “the persuadables” rather than welcoming them into progressive company. What is clear is that progressives need to take the lead in learning more about how they think, and about how conservatives think. Republican leaders will not make an effort to find common ground so it is essential for progressive leaders to reach out to leaders and individual voters who do not share their political point of view. In an effort to help progressive learn more about the political landscape in which we operate, I have initiated further study into the infamous “Republican Brain” and also the Democratic Brain that often views the world in a very different fashion. 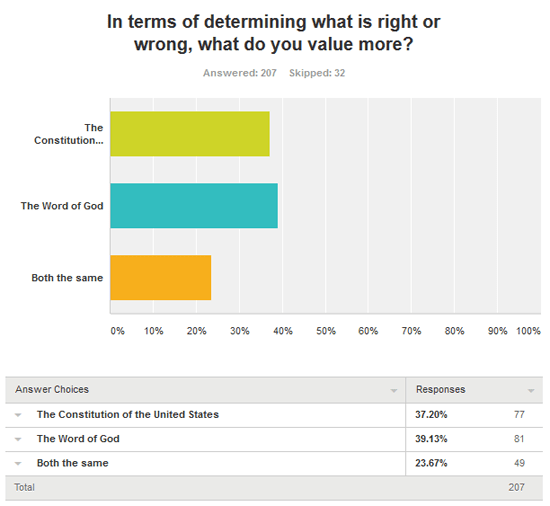 Last month, I surveyed over 200 voters across the nation on bellwether political questions. While the sample size of our survey is small, it is significant enough to make it validate general findings. I offer the results not as “absolute truth,” but rather as talking points and questions that need to be further studied. We’ll focus now on just one of the sixteen questions asked. Many people, particularly those who do not consider themselves to be religious, view the Constitution as the work of many human beings. There is nothing mystical about it but it certainly is a remarkable document. 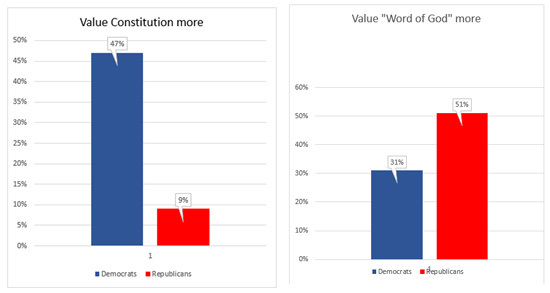 Forty-seven percent of Democrats said that they value The Constitution more than “The Word of God,” while only 9% of Republicans did. Fifty-one percent of Republicans saw “The Word of God” as more important compared to only 31% of Democrats. What do we learn from these results? Even with the limited statistical reliability of the results, we find further indication that Democrats are more aligned with the U.S. Constitution, one of the primary documents of The Enlightenment or The Age of Reason. Republicans were more comfortable with “The Word of God.” One of the things that is rarely discussed is how vague a term “The Word of God” is. Certainly it means one thing to Catholics, another to Protestants, something else to Jews, and something different to Muslims. As we know from the Sunni and Shia fighting in the Middle East, even within one religion the differences can be large. This is a topic for further study. Do those who value “The Word of God” think that there is a divine right or wrong to a woman’s right to choose? What if there is conflicting words within the Bible or the Quran? In subsequent surveys, we’ll dig down deeper on this and then look for possible areas where progressives can better connect with Republicans. This will not be easy, but it is a good place to focus our attention rather than on demonizing those with whom we do not agree. Previous Post:Prejudice on campus: Are you listening, administrators?